Click on the link below to view the new machine. The S9 Elite™ is a sleek, all-in-one system that is ideal for any nightstand. Users can take advantage of EPR settings and Easy-Breathe Technology to drop the pressure upon exhalation so that breathing feels more "natural". The machine is fully customizable with reminders for accessory replacements like your mask or machine filters. The S9 Elite™ can also display advanced therapy and compliance data through the color display. Easy-Breathe technology softens the breathing cycle by monitoring the user's breathing pattern. Along with EPR, the S9 Elite™ synchronizes the user's inspiratory and expiratory cycle. A smoother, more natural delivery of pressure keeps the motor whisper-quiet when operating. Easy-Breathe allows the S9 Series to operate at 24dBA when set to 10cm of pressure from a distance of one meter. The overall reduction in motor operation helps keep conducted noise from traveling through the tubing and away from the mask. No more motor whining and noise generated inside the CPAP hose. EPR decreases the pressure at the beginning of each breath and keeps the pressure low throughout the exhalation. The pressure is reduced by an exact pressure drop of one, two or three centimeters of water pressure. EPR gradually changes therapy pressures so there is little ventilatory effect. EPR also has an Event Detection Circuit. When a sleep disordered breathing event lasts longer than 10 seconds, EPR stops until the event concludes and normal breathing with EPR resumes. EPR with Easy-Breathe technology also allows users to customize the RAMP feature. Set the S9 Elite™ to EPR RAMP ONLY mode to enhance comfort and help improve compliance. Users are more aware of pressure changes as they fall asleep, using pressure relief during the ramp period naturalizes this process. For more information on all these technologies, check out ResMed's Tech Fact Sheet. There are two menus that provide users with information about compliance, therapy and machine settings: Standard Menu and Clinical Menu. Both can be reached by using the "Info" button on your machine, but the Advanced Info Menu will only appear if the machine is in its Clinical Mode. 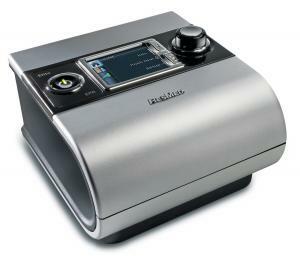 ResMed has re-invented the Humidaire line of CPAP humidifiers. The Humidaire H5i™ incorporates an intelligent humidity controlling technology. The Climate Control system is managed through a combination of the S9 machine, H5i™ humidifier and ClimateLine heated tubing. There are five sensors throughout the system that monitor ambient temperature and patient airflow. The ClimateLine heated tubing uses a built-in mask temperature sensor to reach relative humidity at the mask. Sensors inside and outside the CPAP machine closely monitor changes in humidity and helps prevent condensation from forming inside the tube. Rainout can hinder CPAP therapy and affect compliance. With the H5i™ humidifier, set the level of humidity and attach the ClimateLine tubing to achieve a new level of comfort. The S9 Series CPAP machines come standard with the ResMed SlimLine Tubing. The small diameter air tube is ultra-light, flexible and provides a unique alternative to bulky, generic 6 foot hoses. ResMed also offers a Standard Hose. The ClimateLine Tubing has an internal heated coil and mask temperature sensor that helps manage rainout throughout the hose. Climate Control algorithms measure temperatures from the humidifier to prevent condensation from forming. The ClimateLine Tubing can use the SlimLine Tubing Wrap to achieve total control of rainout.